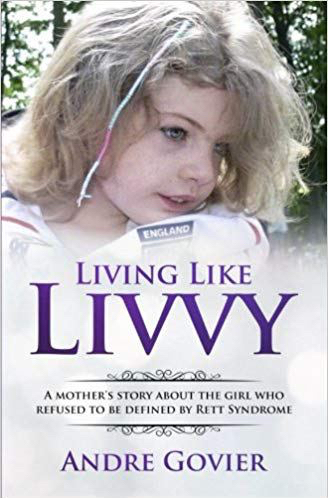 It has been a couple of months now since “Living like Livvy” was published and I cannot tell you how amazing it has been, the feedback from the Rett syndrome community has been amazing but it has also made an impact greater and wider that I could have ever imagined. I have received a number of wonderful messages from those that have read my story and I know Andre has received a lot more. Both of us started this journey with two hopes, one to raise awareness, two to raise much needed funds for research into the cure of Rett Syndrome, I am so thankful that we have achieved both. Yet I know both Andre and myself could never have foreseen how amazing the book has done. The reviews we have received have made all the work (mostly Andre’s) worthwhile, we are hearing from families who have been encouraged to challenge themselves to think outside the box a little more. I’m hearing from parents who feel less alone due to my story. I know how hard it was in the midst of Livvy’s regression and I am so thankful that I can bring some semblance of hope to others. Still I have to confess it has not been easy, walking through my journey has brought back more memories than I could ever have imagined. Talking about Livvy so often has left me feeling waves of grief all over again. Moments shared became moments so terribly missed. It sometimes only feels like yesterday since I lost her, and I cannot get my head around the fact that this November it will be 10 years. I’m not ready for it to be 10 years, when we reach this milestone it will mean that Livvy has been gone longer than we had the gift of her. I cannot go there, I refuse to go into the darkness, Livvy was and always will be my light. I was so blessed to love her, to be her Mama. “Living like Livvy “may have been hard but it’s a gift in its own right, Olivia’s essence breathes through the pages, her courage inspires and her strength holds me up daily. Yet whilst “Living like Livvy” is doing well, Andre and I are far from complacent we still want the story to be shared wider and more funds raised for the much-needed research. We want Rett Syndrome to be cured, we want to live in a world where the diagnoses is not one filled with fear. So, join with us as we continue on our campaign to cure Rett syndrome, buy the book, make a donation and share widely.